Tis the season of holiday gifting and I know you don’t want to be un-surprised so it’s in your best interest to go away starting now. Maybe don’t return til January. OK, gone now? Back to business. The problem came with these socks. See, although they were posted in November ’06, they were actually completed in ’05 sometime – no idea when. Because I never blogged them or took a picture when I first finished them they didn’t get in the pre-2006 count and because they weren’t completed in 2006 they weren’t counted in that year either. But they did make it to Ravelry. So, to make a long story short, until today these were the socks-without-a-number. When I looked at Ravelry I realized that I had never counted these socks so this whole time I had been counting 6 pairs pre-2006 when it was really 7. In any case, when they were finished is a moot point, what matters is that they *are* a pair of socks I completed and thus the following socks are #100. 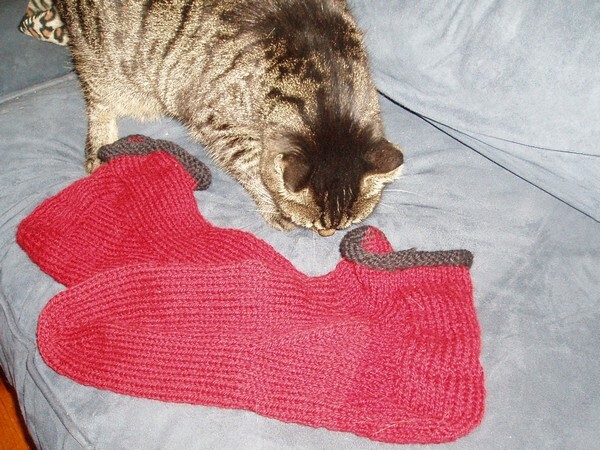 Pan is for scale – these things are about 16″ long pre-felting! 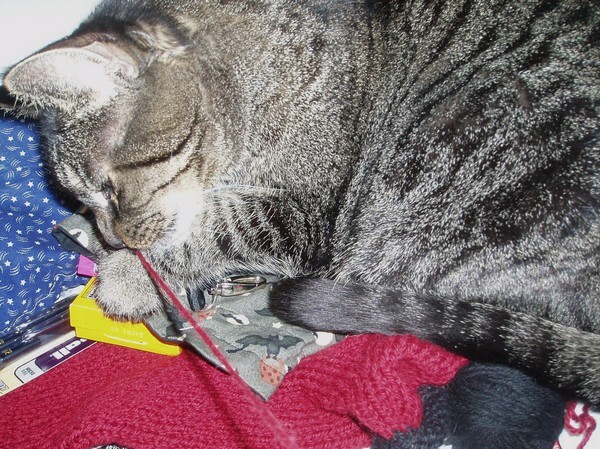 Since I am showing you his amazing modeling skills, I figure I should also give Java credit for helping with the knitting. She likes to get all cozy on the side of my desk, preferably on top of whatever knitting-in-progress is sitting there for computer knitting. This time the yarn was coming from that bag and she got a bit interested when I was pulling. So there it is, the 100th pair of socks knit by me. And I still haven’t heard from my contest winner! Cindy if you’re reading please contact me! If I haven’t heard from you by the end of the week (12/15) I’ll pass the prize on to the next-closest winners. Yep, that would be a tie between Amanda from myonlysunshine and my SP-at-the-time Rockstariel who turned out to be the fabulous weezalana.